One of Denmark's leading young piano talents with international recognition both with his own groups and as a sideman. Kasper Villaume has won several prizes in Denmark and internationally. Villaume has studied with Kenny Werner, Ellis Marsalis and at the Rythmic Conservatory in Copenhagen. He has released several prize-winning CDs as a leader and as a sideman. 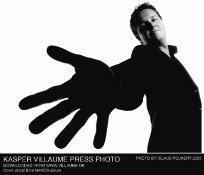 Kasper Villaume is today one of the most popular pianist of the Danish jazz scene. He has played and recorded with Ed Thigpen, Leroy Jones, Benny Golson, Jimmy Heath, Allan Bothcinsky, Danny Moss, Alex Riel, Jesper Lundgaard, Katrine Madsen, Jesper Thilo and Bob Rockwell. He's recorded two leader albums for Marshmallow Records of Japan.